Enjoy some Lucky Soul goodies.... On me! If you feel like you've been hiding behind your fear of not "getting it right" or you're afraid of being judged... and you're ready to drop perfectionism like it's hot and connect with the people who need you the most... this tapping process is for you. It's time to market yourself like you mean it and get your unique message out in the world with confidence. Subscribe to The Lucky Soul YouTube channel for inspirational videos on growing your mindset and confidence, tapping videos, and more. The Lightworkers RISE Online Tribe is a free private Facebook group for self-proclaimed lightworkers. 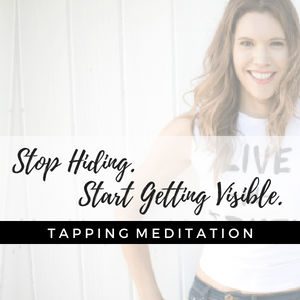 Each week I do a live tapping session in the group tailored to whatever topic you'd like. I also share powerful affirmations, coaching, and help with creating your own personalized tapping scripts and language.